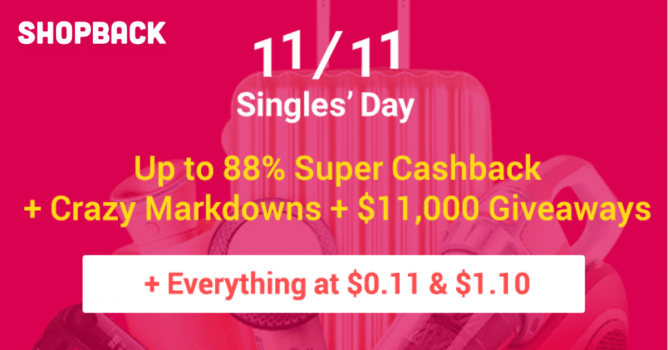 Home > Online > ShopBack: Shop & Win Prizes Up to $11,000 + Enjoy Up to 88% Cashback this 11.11 Singles’ Day! Till 11 Nov 2018 ShopBack: Shop & Win Prizes Up to $11,000 + Enjoy Up to 88% Cashback this 11.11 Singles’ Day! Sales are amazing but do you know that you can earn cashback while you spend? No, this is not a joke! If you love online shopping, a site that will upgrade you to a smarter shopper is ShopBack! With more than 1,500 eCommerce merchants onboard, ShopBack counts Taobao, Expedia, Lazada, Zalora and other well-known local and international brands amongst its merchants. Aren't these all our favourite places to shop at? Every dollar you spend at these sites can earn you cashback at ShopBack. And they pay you real cash straight into your UOB, POSB, DBS, OCBC and other local bank accounts! No gimmicks, just rewards when you head to your favourite online stores via ShopBack! Sign up for a free account today to win up to $11,000 and enjoy up to 88% cashback at ShopBack's 11.11 ShopFest! 1. Are You The One? On 11 November, be the 1, 11, 111, 1111th person to shop via ShopBack & you may win yourself prizes worth up to $11,000! You never know when you get lucky! Prizes include Apple iPhone XS, Samsung Galaxy Note 9, Dyson Airwrap Styler, Dyson Vacuum Cleaner, lots of vouchers and the list goes on! Get ready and shop at selected merchants such as Taobao, Zalora, Lazada, Qoo10, Shopee, ASOS to qualify! The highlight of Shopback's 11.11 ShopFest is of course the upsized Cashback you can earn! You can enjoy up to 88% Cashback on your favourite brands + Top 11 Brand Highlights starting from 10 November, 11pm to 12 November, 12am! You can only earn cashback some of the merchants via app so shop at the merchant via ShopBack app! To prevent shoppers from forgetting to shop via ShopBack, they have a ShopBack Cashback Buddy Extension that you can install on your browser and get alerts whenever you're at a store that offers Cashback via ShopBack. You can easily activate and earn Cashback at your favourite ShopBack stores without having to visit ShopBack.sg first. This way, you’ll never ever miss out on another Cashback! Once you shop via ShopBack, your transaction will be recorded and the cashback will be pending for a period of time as the merchants will have to validate your purchase and ensure that there are no cancellations or returns. You will receive an email to inform you when the cashback is confirmed. To cash out, you must meet the minimum Available Balance of SGD10 in your ShopBack account. After you hit the minimum amount, you can withdraw the money to your bank account or Paypal. The process will take 7 to 14 working days. Sounds simple enough right? With just a few clicks, you can save even more on your shopping! If you are going on a holiday, definitely book through the travel merchants on ShopBack such as Agoda, airbnb, Booking.com, ZUJI and more to get cashback on your spend! Previous: [HipVan] Feeling a lazy friday? Next: [Triumph] 11/11 Flash Sale In 2 More Days!